Happy Monday! I didn't mean to take a week off from blogging, but I had a hard time finding a spare moment to spend in front of the computer. I've been preparing a few more samples for my Quilt Con classes. I can't believe I leave on Thursday already! 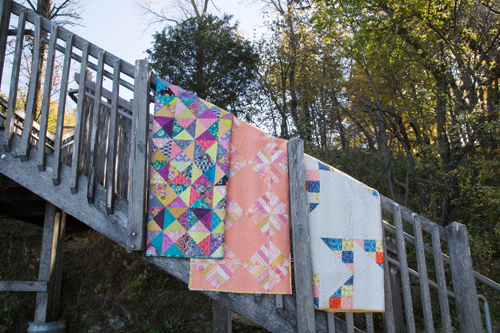 Today I want to share one of my favorite quilts from my book, Patchwork Essentials: The Half-Square Triangle. I'd like to work through the book, sharing in depth about at least one quilt per chapter. 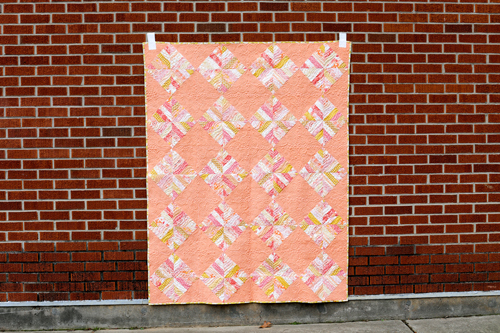 The quilt I'm going to share today is Citrus Peel, from the Patchwork Play chapter! 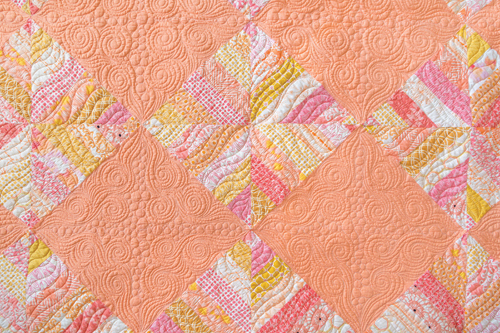 Citrus Peel was based on a quilt I pitched for a collective book back in 2011. I found the PDF I made up to share my idea, thought it was kind of fun to look back on! You can see strips and finished block is a bit different from Citrus Peel, I have learned a lot since 2011! For the fabrics and colors, I wanted to challenge myself to use a color I don't use a lot: peach. I started with the peach solid and from there added peach, coral, pink, gold, and light orange prints. 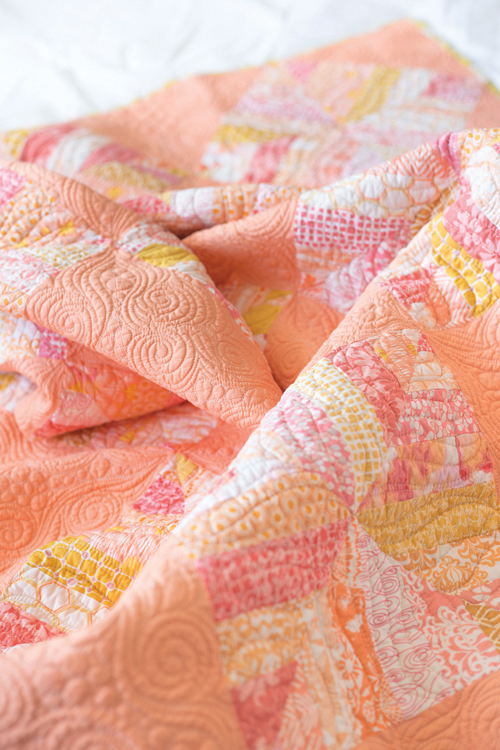 Citrus Peel was quilted by Melissa Kelley of Sew Shabby Quilting. Melissa knocked this quilting out of the park. It is seriously stunning in person, photos really don't do the texture justice. I especially love what she did in the solid areas. For each quilt in the book, I stitched a sample block or in some cases an entire quilt top in a variation of the design. 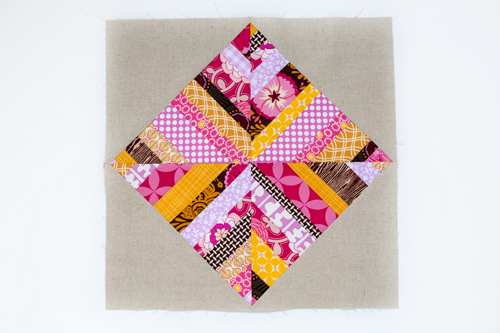 For Citrus Peel, I chose to stitch up the block in the same way, but in a color scheme with more contrast. I'd love to make a whole quilt in these colors! 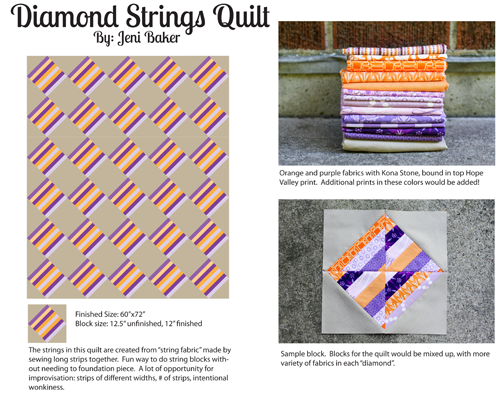 Before making this quilt, I had always wanted to make a strip quilt. I really loved the process of making this quilt, and I'd love to make another. I just need to decide what colors to use, and find the time. I also want to make one with just strings, no solid. It would completely change the look of the quilt! I really like the pattern but the quilting is truly amazing. 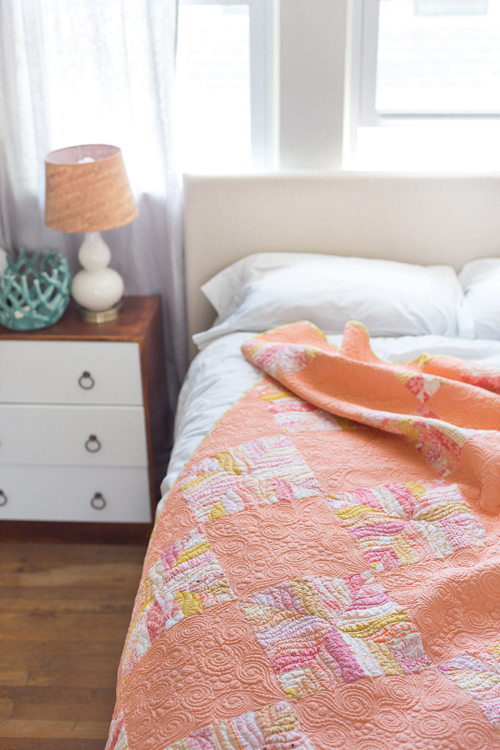 Gorgeous quilt, lovely soft colours, though I am not really a peach person. Your trial block is more my cup of tea - really zingy. I am definitely inspired to make this quilt. Thanks for sharing. Congratulations, Jeni. What a great quilt. I do love peach. I agree with Robby H. that the solid squares do the eye a place to rest.